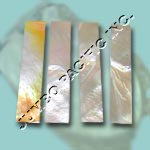 Mother of Pearl is an organic-inorganic composite material produced by some molluscs as an inner shell layer, it also makes up the outer coating of pearls. 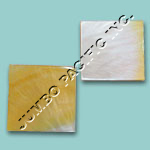 They are characterized by their translucence and lustre and by a delicate play of surface colour called orient. The more perfect its shape (spherical or drop-like) and the deeper its lustre, the greater its value. Only those pearls produced by mollusks whose shells are lined with mother-of-pearl like oysters and fresh water clams are really fine pearls. Pearls from other mollusks are reddish or whitish or lacking in pearly lustre. Jewelers commonly refer to saltwater pearls as Oriental pearls and to those produced by freshwater mollusks as freshwater pearls. 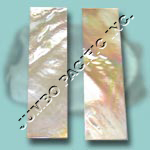 Numerous items can be done in mother of pearl MOP shell. 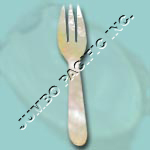 This can be used as kitchen utensil applicable for both personal used or for display or a decoration. 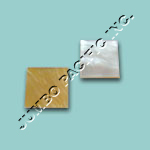 MOP chips in a different shapes can be used as pendant in fashion accessories. 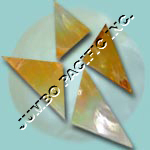 MOP polished plate and MOP round chip can be a components to create another piece of item. 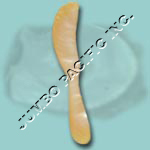 Every a piece of mother of pear shell it can be transformed into MOP chips. 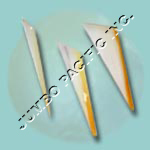 It may create kitchen utensils like spoon, fork, knife and plate. 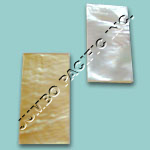 MOP shells are carefully laminated and crafted to create these wonderful piece. 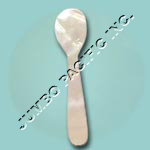 An elegant-looking utensils during special occasions and as wells for everyday use. These MOP utensils are also great for decoration.